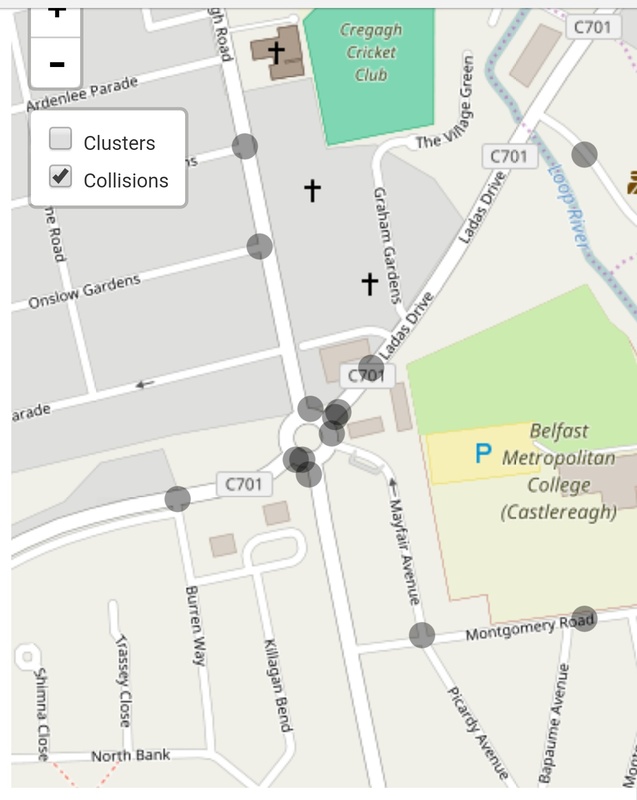 The roundabout outside Stranmillis College is pretty horrific as a cyclist at night. Probably should have used the zebra crossings. Stranmillis Roundabout in South Belfast is used as an alternative route for commuting cyclists accessing the Towpath in winter when the Botanical Gardens are closed. 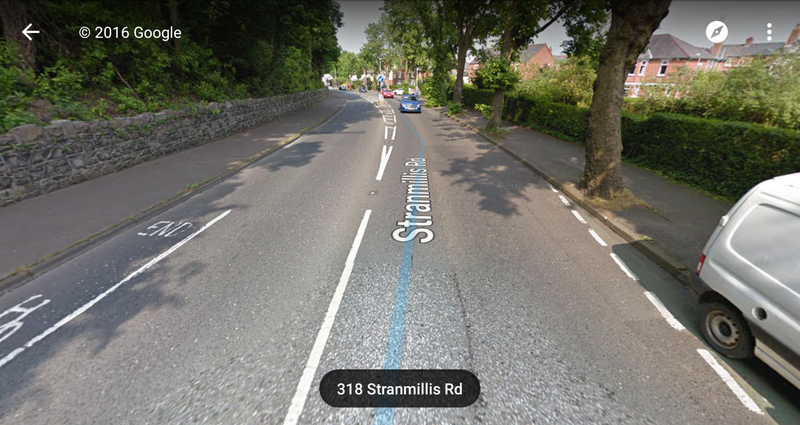 The roundabout has 5 arms, clockwise from the north: Stranmillis Road (N), Stranmillis Embankment, Lockview Road, Stranmillis Road and the entrance to Stranmillis College. The roundabout is a standard UK circle with two rings, a central island and has zebra crossings across all the arms. There are 2 bus stops: just north of the college gates for city bound Metro services and at the start of Stranmillis Road for outbound services. A small Belfast City Council run car park is situated between Stranmillis Road (N) where you also find a bottle bank. The area to the south is mainly residential with a few small business at Lockview Road, including 5a, a cycling themed café. To the west is the Stranmillis College estate; the Lagan to the east and Stranmillis village and Queen’s University to the north. 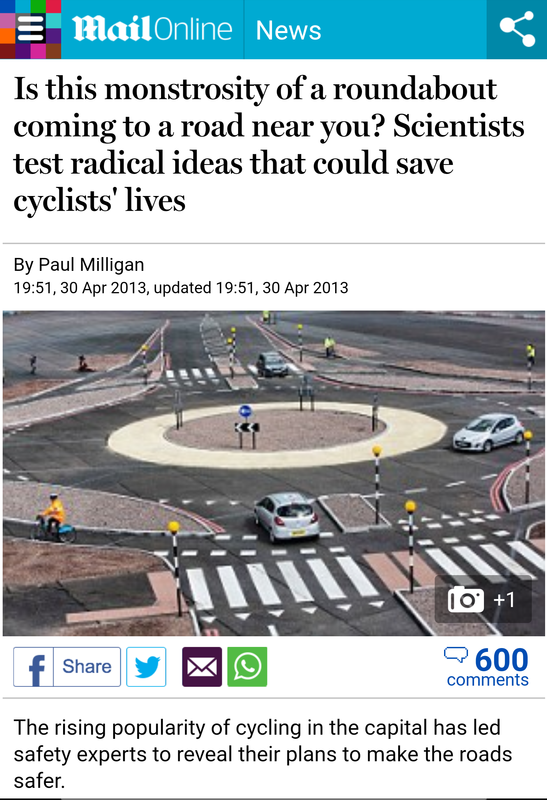 The roundabout has no dedicated space for cycling. Stranmillis Road has a painted cycle lane, but this stops well short of the circle. There is a short shared use path from the roundabout along Stranmillis Embankment towards the Lagan. A marked crossing takes cyclists to the segregated path on the other side of the Embankment. 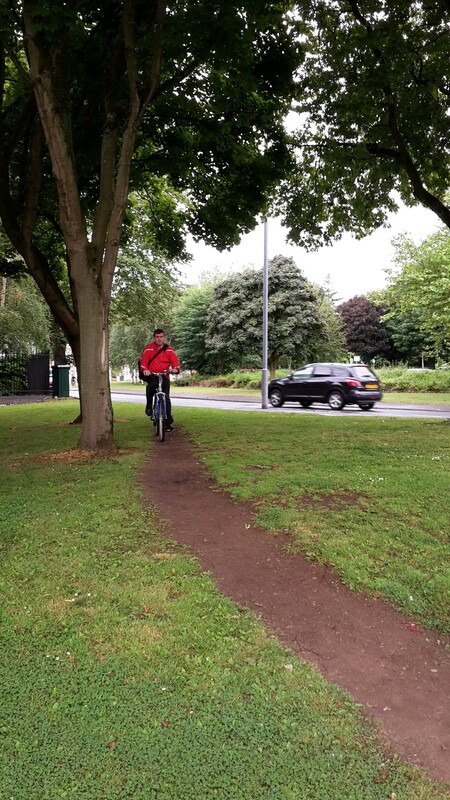 Most cyclists ignore the shared use path and instead cycle down to the river on the footpath on the other side of the road and follow the track used by the cyclist in the photo above. 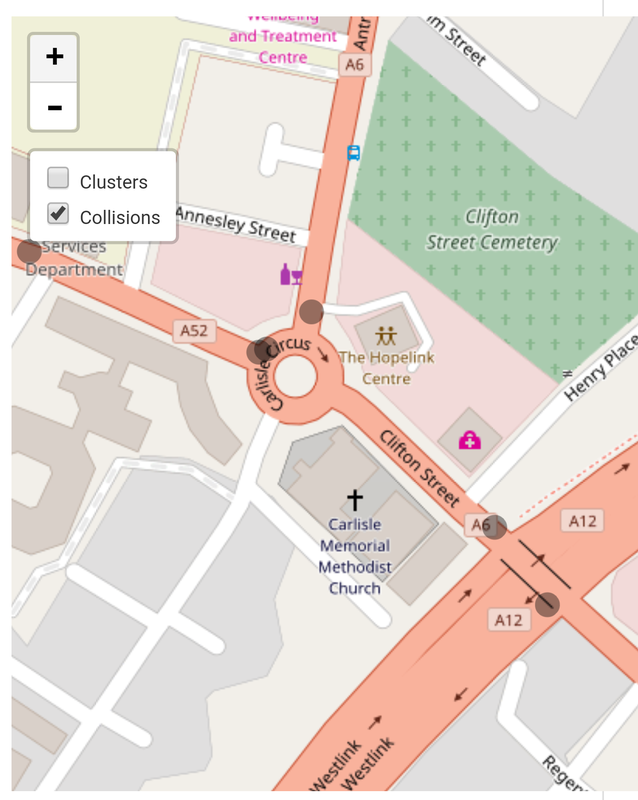 Because it is directly adjacent to one of Belfast’s busiest cycle routes the roundabout’s layout should be altered to accommodate cycling. For a more detailed report see the TRL report (pdf) and the view of the LCC here. 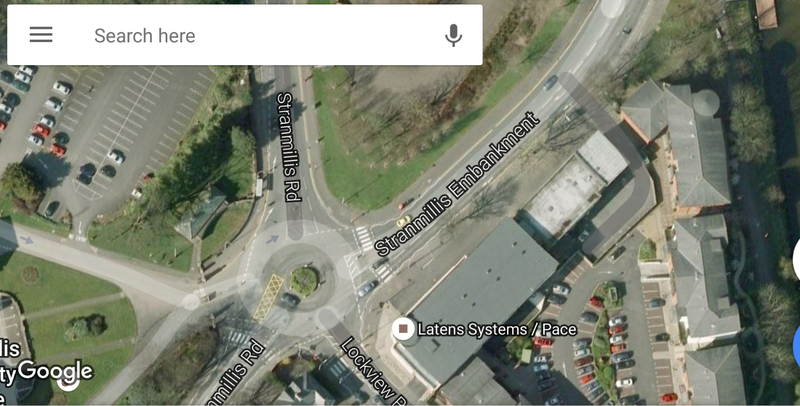 Currently Stranmillis roundabout is set up to improve traffic flow. 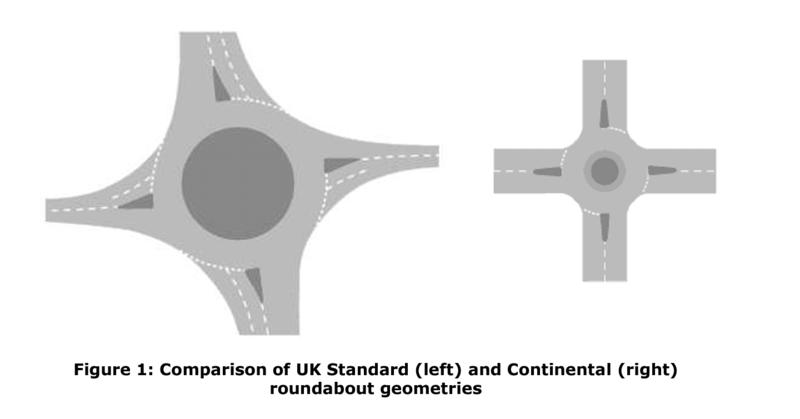 In contrast, continental designs of roundabouts have road user safety in mind. The most significant change would be reduction in number of lanes approaching the circle, and reducing the circling lanes from two to one. 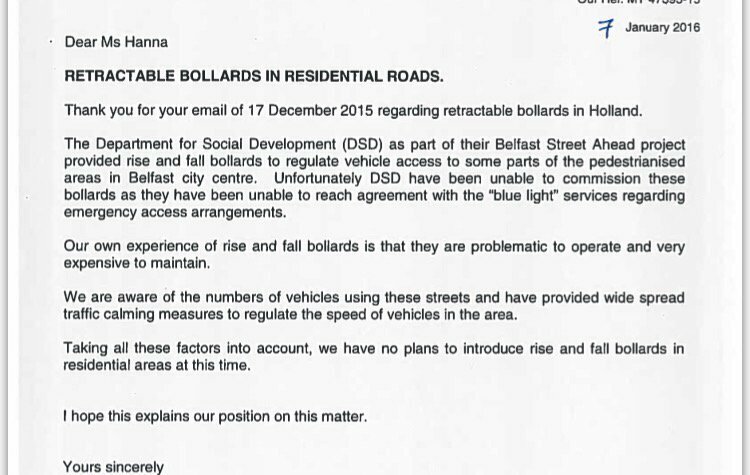 At Stranmillis there is an over-provision of vehicle space. Most of the day the circle is quiet. At rush hour the roads in the area grind to a halt. Either way, the present circle is not meeting needs. 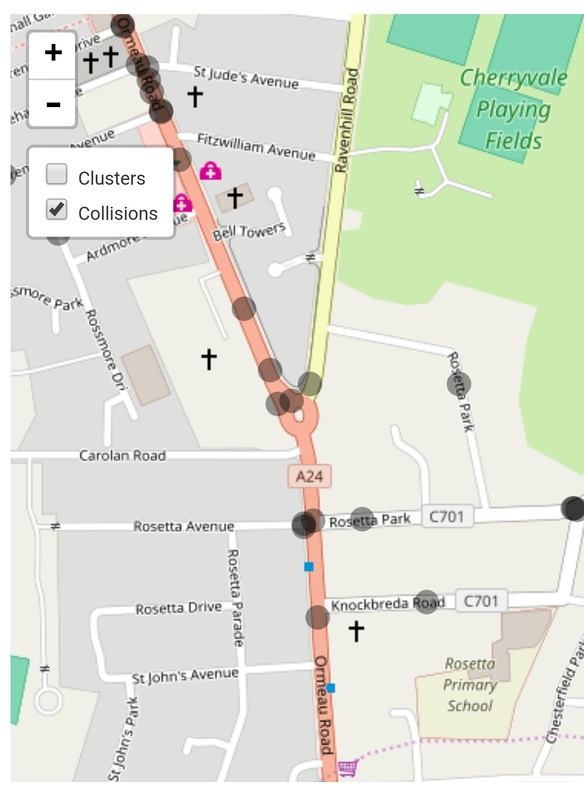 The traffic levels in Stranmillis fall within the first category: a roundabout with one circling lane and single approaches should suffice. The area sees a peak flow of approximately 1400 vehicles per hour, and 14,000 vehicles a day. 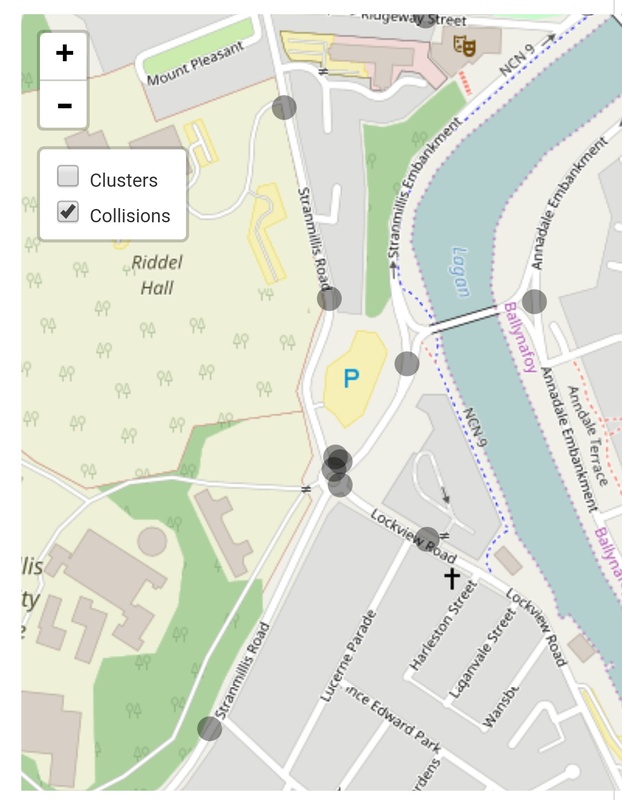 There are significant numbers of pedestrians and cyclists using the circle, due to its proximity to the University, Stranmillis College and the Towpath. 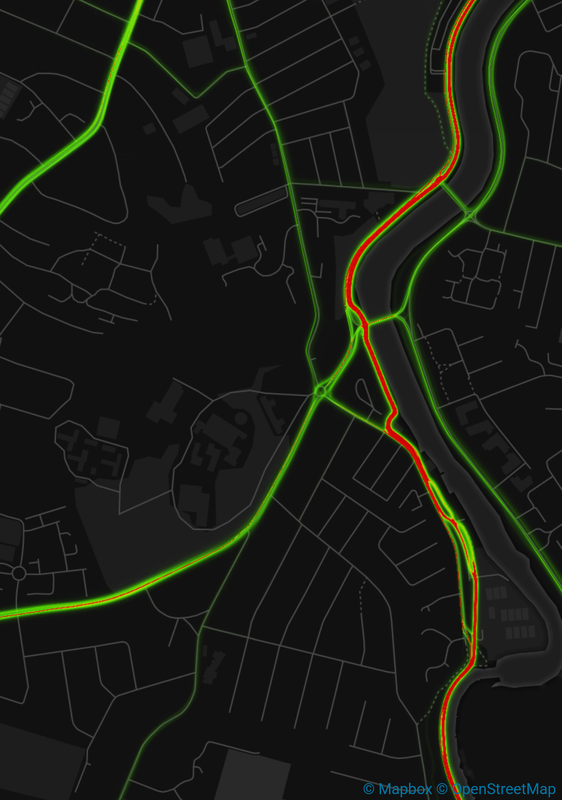 At present northbound traffic is split between two lanes, which past the roundabout are merged on Stranmillis Embankment. Why? 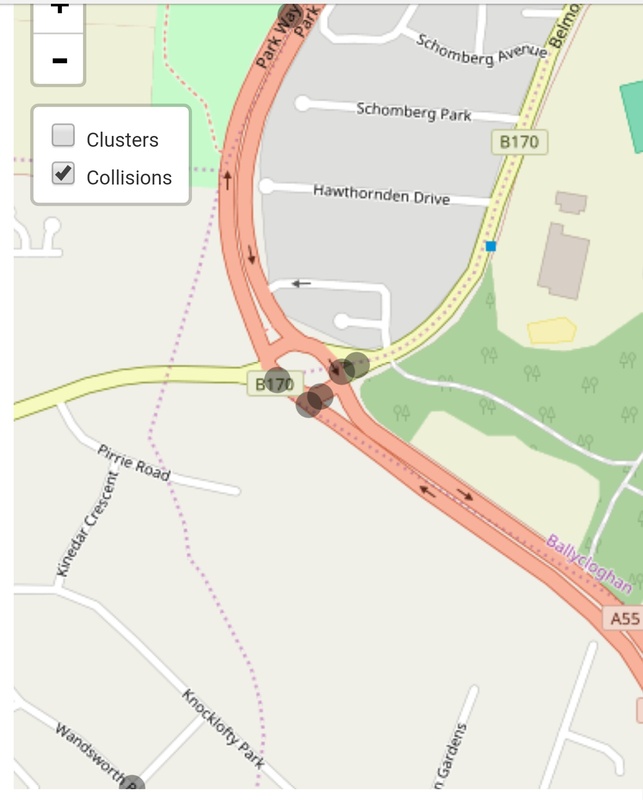 The merging causes delays for traffic leaving the area. It is an area of conflict between drivers, and it should not surprise most collisions involving cyclists are here. Reducing vehicle traffic space will increase available space for pedestrians and cyclists. More space can be found by realigning the arms and make the entries and exits less flared. Reducing vehicle space is something guaranteed to raise hackles within the NI Department of Infrastructure. Despite the pro-cycling leadership proposals to reduce speed limits, impose filtered permeability, bung up rat runs, remove vehicle access, etc are met with Departmental opposition. If we want to grow cycling in Belfast we need to rearrange our road space, and start thinking about moving people rather than vehicles. So more bus lanes, not fewer and segregated safe space for cycling along main arterial roads. 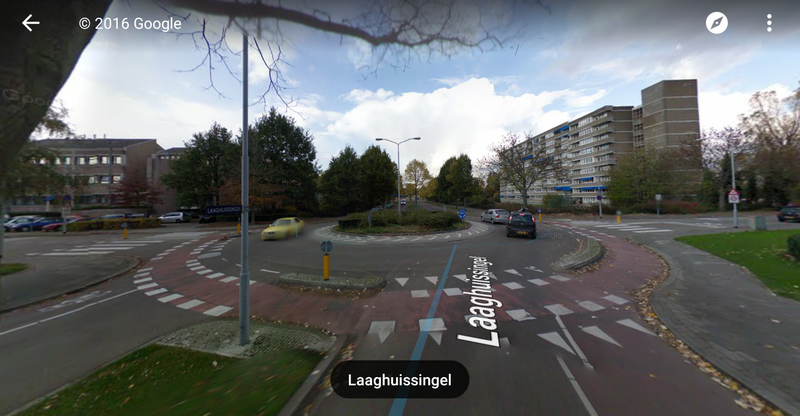 And what are Dutch roundabouts like for cyclists? Another cyclist death, another HGV involved. 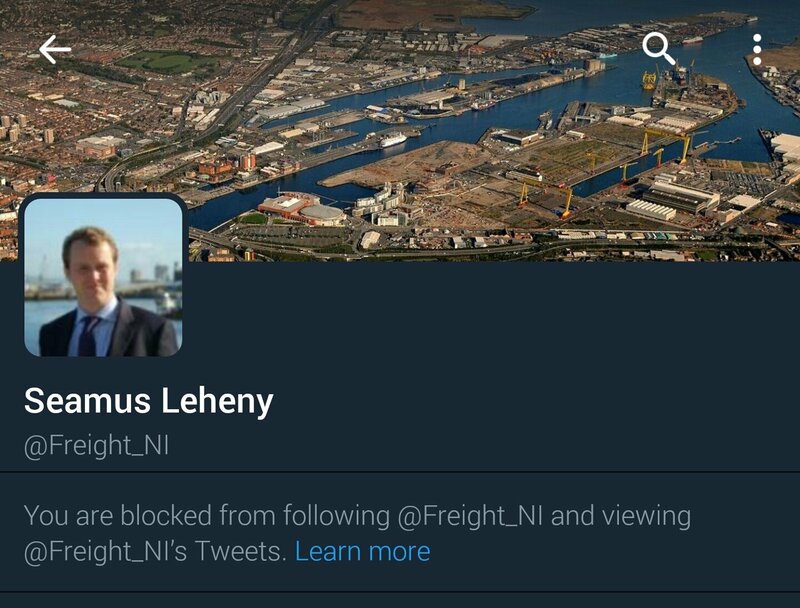 How many must die for @Freight_NI to accept it is an industry wide problem? 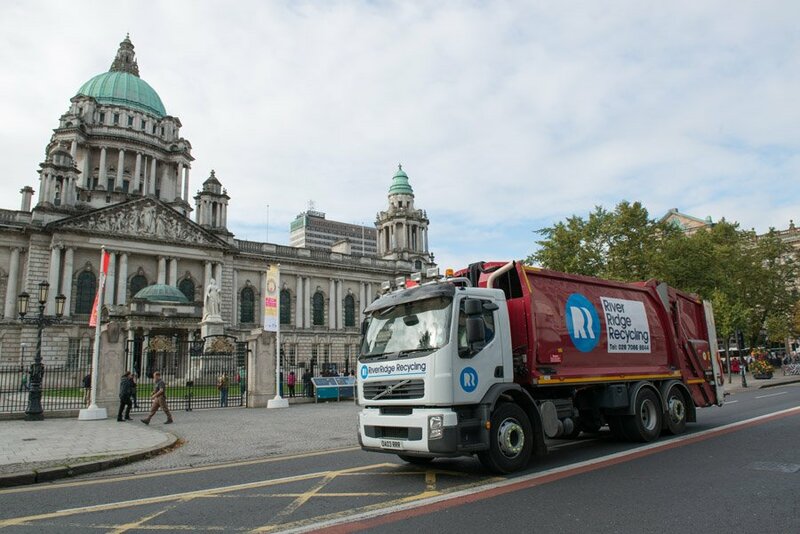 The FTA in NI are proud of their initiative to send HGV drivers into Belfast on their bicycles. It is a good initiative, facilitated by Sustrans. Some of our drivers will be taking to their bikes in Belfast today as part of the Safe Urban Driving course 🚴 Wish us luck! 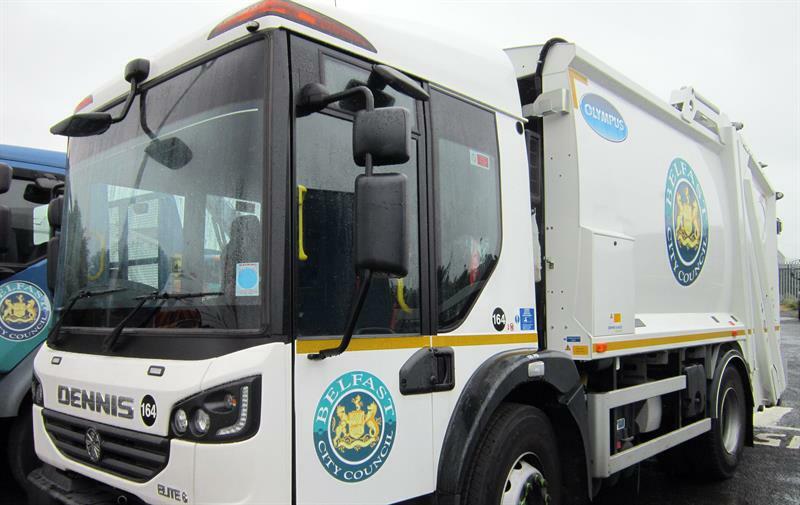 No surprise then that River Ridge Recycling won a prestigious road safety award in September ’16. Well done! But there’s a problem. Look at the photos. 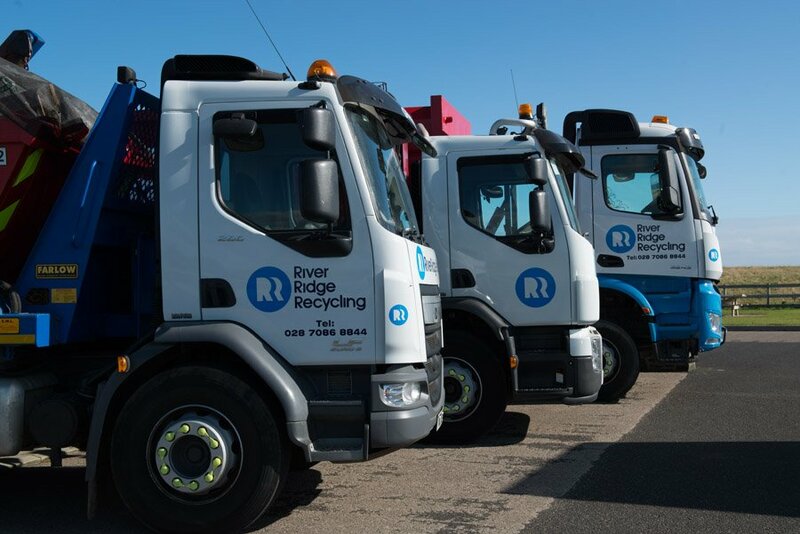 River Ridge Recycling operate mainly in urban areas, with vehicles fitted with standard cabs and lacking guard rails. The FTA in NI have long argued that road deaths, drivers and vehicles breaching regulations are down to a few rogue operators; that the majority operate within the law. “In 2015, we checked 17,319 commercial vehicles; 43% were found to be non-compliant with road safety laws”. See: https://t.co/0MknWvyNbf. Quite apart from the aforementioned 56% of HGV drivers who drive whilst using mobiles. The industry and its representatives have a choice. Either, address road safety issues by, for a start, removing unsafe vehicles from our streets, arguing for stricter fines and punishments for operators who break the laws and adopting safer lorry designs. Or block people on Twitter.